Tried, tested and used internally by Martin Professional for years, Pro Clean Supreme maintenance fluid for haze and smoke machines is now available to the market. Using Pro Clean Supreme on a regular basis reduces clogging, extends the life of haze and smoke machines and keeps atmospheric effects performing at their highest level. 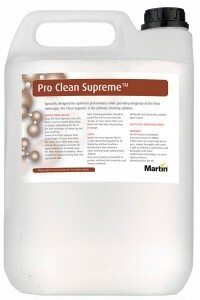 By providing longevity of the heat exchanger, Pro Clean Supreme is both a professional and cost-effective cleaning solution. It is water-based and leaves no residue. By using the highest grade ingredients available while remaining eco-friendly, Martin fluids are both effective and safe.